Seniors: As graduation approaches, it is time to think about the words of wisdom you would like to share with your classmates, families and friends. All applications are due by 2:30 pm today. We look forward to hearing your ideas. Auditions for next year’s advanced and honors choirs are happening now. Please sign up for a time during AEP or after school on the door of room 625. Please see Mr. Rapach if you have any questions. Staff & students: LHS has a new program to help minimize the amount of electronic device thefts – “RYED”. The Register Your Electronic Device program is a simple and free protection plan for your devices. You may take your electronic device to Officer McLaughlin to have the make, model and serial number of your device registered. Please see Officer McLaughlin for more information about this new program. The VASTAR computer refurbishment group will meet immediately after school today in room 104. If you have any questions please see Mr. Aadahl in room 104. Auditions for next year’s advanced and honors choirs are happening now! Please sign up for a time during AEP or after school on the door of room 625. Please see Mr. Rapach if you have any questions. Sophomores and Juniors: All New Horizons applications are due to the Counseling Office by Wednesday, March 29th. See your counselor if you have any questions. It’s Teen Tech Time in the media center! If you want to learn about Virtual Reality and Augmented Reality, sign up to attend this workshop Thursday, March 30th during AEP in the Media Center. You must sign up for a pass in advance from the Media Center. All participants will be entered into a drawing for a gift pack from GizMoes. Seniors: As graduation approaches, it is time to think about the words of wisdom you would like to share with your classmates, families and friends. If you are interested in speaking at this years’ graduation ceremony, please visit the LHS Home page for the link to the application or stop by Mrs. Newcomb’s office to pick one up. All applications are due by 2:30 pm on Thursday, March 30th. We look forward to hearing your ideas. The LHS book club will be meeting during AEP today. Please bring your copy of Shutter with you. Cheerleader Meeting: Come out to our open gym and skill building clinic. There will be an informational meeting on Tuesday, March 28th at 5:30 pm in the upper commons. If you have any questions, please see Coach Channing in the café. It’s Teen Tech Time in the media center! If you want to learn about Virtual Reality and Augmented Reality, sign up to attend a workshop Thursday, March 30th during AEP in the Media Center. You must sign up for a pass in advance from the Media Center. All participants will be entered into a drawing for a gift pack from GizMoes. 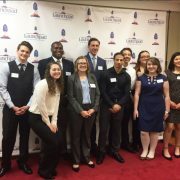 Congratulations to our students who participated in the LEAD Historic Triangle Youth Leadership Project! https://wjccschools.org/lhs/wp-content/uploads/sites/20/2017/03/leadership-e1490365785913.jpg 499 665 Jennifer Cummings https://wjccschools.org/lhs/wp-content/uploads/sites/20/2017/10/Lafayette-High-School.png Jennifer Cummings2017-03-24 10:31:242017-03-24 10:31:24Congratulations to our students who participated in the LEAD Historic Triangle Youth Leadership Project! The LHS book club will be meeting during AEP on Monday, March 27th. Please bring your copy of “Shutter” with you. The ASVAB will be administered here at Lafayette on Wednesday, April 12th Interested Juniors and Seniors may sign up in the counseling office to take the test. Deadline to sign up is Thursday, March 30th. Attention staff & students: LHS has a new program to help minimize the amount of electronic device thefts – “RYED”. The Register Your Electronic Device program is a simple and free protection plan for your devices. You may take your electronic device to Officer McLaughlin to have the make, model and serial number of your device registered. Please see Officer McLaughlin for more information about this new program. Cheerleading Meeting: Come out to our open gym and skill building clinic. There will be an informational meeting on Tuesday, March 28th at 5:30 pm in the Upper Commons. If you have any questions please see Coach Channing in the café. The VASTAR computer refurbishment group will meet immediately after school today in room 104. Please see Mr. Aadahl if you have any question. This past weekend at the New Kent Track Invitational, LHS boys placed first and the girls placed 2nd. Excellent performance, Running Rams! Students planning to take an AP exam this year, the deadline to register is today. Visit the Total Registration site now to sign up. See your counselor or AP teacher if you have any questions. The VASTAR computer refurbishment group will meet immediately after school on Wednesday, March 22nd in room 104. Attention Seniors: As graduation approaches, it is time to think about the words of wisdom you would like to share with your classmates, families and friends. If you are interested in speaking at this years’ graduation ceremony, please visit the LHS home page for the link to the application or stop by Mrs. Newcomb’s office to pick one up. All applications are due by 2:30 pm on Thursday, March 30th. We look forward to hearing your ideas. Congratulations to Abbey LaVelle and Mary Gray! They came in first place this past weekend at the Virginia Beach and Norfolk school bridge club end of year tournament. They will be attending the 2017 Youth North American Bridge Championships in Toronto, Canada at the end of July. Good luck, ladies! Students planning to take an AP exam this year, the deadline to register is Tuesday, March 21st. Visit the Total Registration site now to sign up. See your counselor or AP teacher if you have any questions. Today we recognize English as a Second Language on the last day of World Language Week. Today’s trivia question is: How many languages are represented by English Language Learners here at Lafayette? Teachers please email your classes response to Mrs. Guzman. Want to free up your schedule for next year? Need Economics and Personal Finance to graduate? Looking to take an online class and have the flexibility to do work anytime and anywhere? 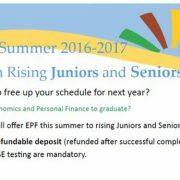 WJCC will offer EPF this summer to rising Juniors and Seniors. A $50 refundable deposit (refunded after successful completion of the course) and W!SE testing are mandatory. FREE Course Opportunity for Juniors and Seniors! • Return the completed EPF registration form by Fri-day, May 25, 2017 to school counselor. • As the seats begin to fill, preference will be given to graduating Seniors. • Must have access to internet and computer technol-ogy over the summer. • Must have the willingness to accelerate learning and earn credits needed to graduate. If you are interested, please complete the registration form found in the link below.